For over a century, cinema has been one of the world’s most powerful stimuli in influencing the masses. Cinema has influenced almost every aspect of life and has profoundly shaped the ways in which we perceive the world and comprehend our place in it. Today, movie making has evolved into a multi-billion dollar industry that includes theatrical exhibition as well as home video, television broadcast rights and merchandising. Avatar, an American epic science fiction film released in 2009, is the world’s biggest commercial hit making almost $2.8 billion worldwide. It has surpassed the record of James Cameron’s Titanic that held the record for almost twelve years. Avatar was directed and written by James Cameron, and the star list included Joel David Moore, Sam Worthington, Stephen Lang, Zoe Saldana, Michelle Rodriguez, Giovanni Ribisi and Sigourney Weaver. The theme of the movie is of the mid-22nd century; in 2154, a human company is engaged in mining Pandora’s reserves of a precious mineral called unobtainium. Pandora is the abundant moon of Polyphemus, which is one of three gas giants that orbit Alpha Centauri 4.4 light years from Earth. The plan of mining development becomes a threat to the local tribe of Na’vi—a humanoid species native of Pandora. The movie has won three Academy awards for Best Cinematography, Best Visual Effects, and for Best Art Direction. 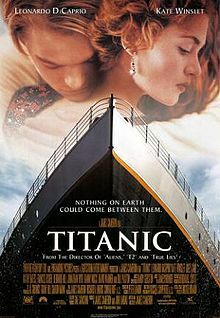 Released in 1997, Titanic is an American movie on romance and disaster of the giant ship, Titanic. The movie is written and directed, co-produced and co-edited by James Cameron. The movie features Kate Winslet as Rose DeWitt Bukater, Leonardo DiCaprio as Jack Dawson, Gloria Stuart as Old Rose, and Billy Zane, as the fiancé of Rose. Jack and Rose fall in love in their unfortunate journey that ends into the world’s biggest ship disaster. 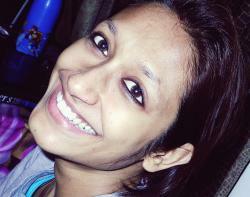 James Cameron has intermingled a short love story to human loss to convey the emotional message of the tragedy. Harry Potter and the Deathly Hallows – Part 2 is an epic fantasy series released in 2011. 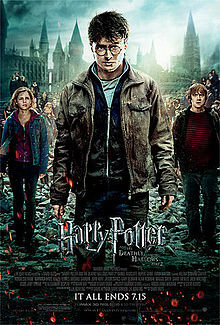 It is based on the novel Harry Potter and the Deathly Hallows by J. K. Rowling and directed by David Yates. It is the eighth and final series of the Harry Potter film series. The theme is the sequence of previous parts where Harry Potter has to destroy Lord Voldemort’s Horcruxes. The series was a complete financial success and was the best-reviewed film of 2011 and hugely appreciated worldwide. It also claimed the opening weekend record with $483.2 million at the box office. The movie is the highest grossing film in the Harry Potter series, the highest grossing film of 2011, and now the third highest grossing film of all time and ninth film to earn more than $1 billion. 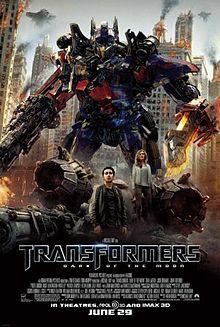 Transformers: Dark of the Moon, an American science fiction action film released in 2011, is based on the Transformers toy line. It is the third part of the live-action Transformers film series. The previous series of it are Transformers and Transformers: Revenge of the Fallen, which have been directed by the same director Michael Bay and produced by Steven Spielberg. The movie received diverse critical remarks; it was praised for visuals and 3-D action sequences, but criticized for writing, acting, as well as the length. The film is the highest grossing film in the Transformers series, the second highest grossing film of 2011, fourth highest-grossing film of all time, and the tenth film to gross over $1 billion. The film was nominated for three Academy Awards for Best Visual Effects, Best Sound Editing and Best Sound Mixing. 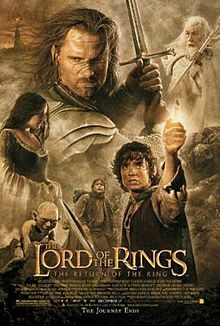 The Lord of the Rings: The Return of the King, a fantasy-drama film released in 2003, based on the second as well as third volumes of The Lord of the Rings written by the English author of the classic high fantasy, J. R. R. Tolkien. The film was directed by Peter Jackson in 2003. It is the final series after The Fellowship of the Ring released in 2001 and The Two Towers in 2002. The Lord of the Rings: The Return of the King remarkably won total eleven Academy Awards of its nominations. It was the first ever fantasy film to win the Academy Award for Best Picture. Surpassing Finding Nemo, in 2003, it become the highest-grossing film. 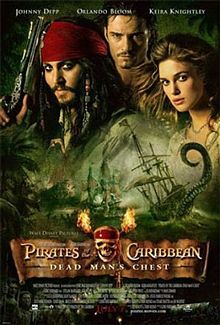 Pirates of the Caribbean: Dead Man’s Chest, an American adventure fantasy film as well as the second part of the series of Pirates of the Caribbean, was released in 2006. The film was directed by Gore Verbinski, written by Ted Elliott and Terry Rossio combined, and produced by Jerry Bruckheimer. The film was praised for its special effects but also criticized for its plot and running time. The film made numerous records including earning $136 million in its first three days of the opening in the United States. It became the fastest movie to gross more than $1 billion across the globe at box office. In 2011, it ranked the 6th highest-grossing film of all time and the highest-grossing film by Walt Disney Pictures. The film grossed $423,315,812 in the North America and $642,863,913 in other regions and total $1,066,179,725 across the globe. It is the highest-grossing Disney film and sixth highest-grossing film of all time worldwide. It is also the highest-grossing film of 2006 worldwide. 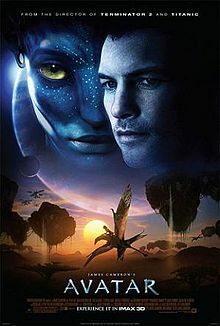 Until 2011, it held the record of reaching the $1-billion-mark worldwide and broke by Avatar in January 2010. 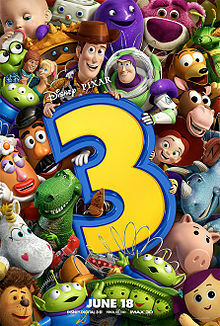 Toy Story 3 is an American 3D computer-animated film which is the third part of the Toy Story series. It was directed by Lee Unkrich, produced by Pixar and released worldwide by Walt Disney Pictures in 2010.The theme emphasizes on the toys Buzz Lightyear, Woody, and their friends who are engaged in dealing with the uncertain future when their owner, Andy, decides to leave for college. Tom Hanks, Joan Cusack, Tim Allen, Don Rickles, John Ratzenberger, Jeff Pidgeon, Wallace Shawn, Estelle Harris, Jodi Benson, John Morris, R. Lee Ermey, and Laurie Metcalf were voice artists according to the roles. The movie was nominated for five Academy Awards that included Best Picture, Best Adapted Screenplay, and Best Sound Editing and won the awards for Best Animated Feature as well as Best Original Song. The film is the highest-grossing film of 2010 in Canada and the United States and later became the 7th highest-grossing film of all time. 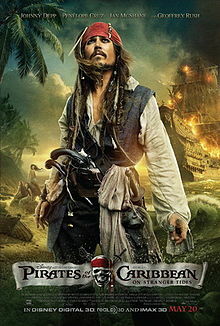 Pirates of the Caribbean: On Stranger Tides, an adventure fantasy film, is one of the fourth part of the Pirates of the Caribbean series released in 2011. First three series were directed by Gore Verbinski, and fourth part was directed by Rob Marshall. However, Jerry Bruckheimer remained as the producer in every series. Despite its mixed critical reviews over the script-writing, excessiveness, and lack of originality, it is the 8th highest-grossing film of all time. The movie made $26.8 million from Russia and $2.15 million from Ukraine. It earned $108,856,481 from Japan, which was the highest-grossing market after North America. The film’s trailer and TV spot were nominated for Golden Trailer Awards and the film was nominated for four Teen Choice Awards – for Sci-Fi/Fantasy Movie, Sci-Fi/Fantasy Actor, Sci-Fi/Fantasy Actress, as well as Villain. Alice in Wonderland, is an American computer-animated film released in 2010, is among the highest-grossing movies of all time. The movie was directed by the American film director, producer, writer as well as artist Tim Burton; written by Disney’s animated feature film writer Linda Woolverton; and released by Walt Disney Pictures. The movie stars Johnny Depp, Mia Wasikowska, Michael Sheen, Anne Hathaway,Crispin Glover, Helena Bonham Carter, Matt Lucas and Stephen Fry. The movie is inspired from the fantasy novel ‘Alice’s Adventures in Wonderland’ and Through the Looking-Glass by Lewis Carroll in 1865.and 1871. The film grossed over $1.02 billion across the globe. 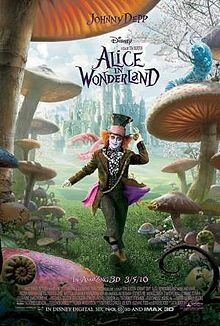 Alice in Wonderland won for Best Art Direction and Best Costume Design At the 83rd Academy Awards and as of 2011, it is the ninth highest-grossing film of all time. 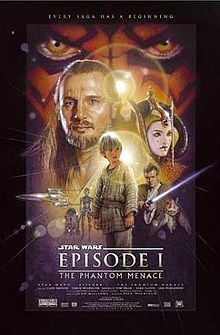 Star Wars Episode I: The Phantom Menace, an American space opera (a subgenre of science fiction that highlights romantic, and melodramatic adventure) film, was released in 1999. The story was written and directed by George Lucas. In spite of miscellaneous reviews about its writing, characterization and acting by critics, it successfully grossed $924 million across the world during its preliminary run in theaters and after re-releasing in 3D in 2012, it grossed an additional $87.4 million in its first week of opening. The film has made over a billion till date. British film magazine Empire enlisted The Phantom Menace in a 2008 list of the 500 greatest movies of all time. Though it was nominated for three Academy Awards – for Best Sound Effects, Best Visual Effects, as well as Best Sound but did not win any.